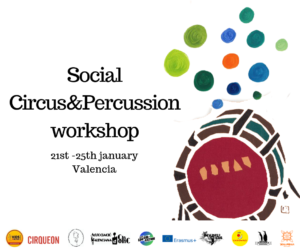 The Social Circus & Percussion workshop will focus on the research, development and practice regarding the fusion of this 2 artistic disciplines which can be used as tools to work with groups at risk of social exclusion. Research how this 2 techniques can be merged. It will be mainly focused on object manipulation and juggling. Develop dinamiques, exercises and methodologies to be applied in social intervention. Practice and experience how this learning process can be transmitted to a social youth group. 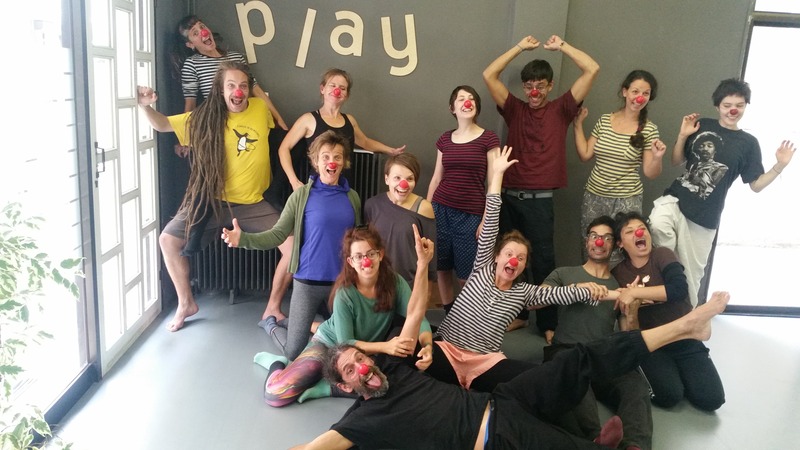 All the participants are invited as well to join us in the Kaotik Circus Festival 2019 (25th to 27th January) where we might be able to create a small show with the youth created during the workshop. The learning process that we will experience will be focused on methods that allow the implication of the participants by exploring and discovering. With activities where the participants have the chance to involve themselves and to feel a needed part of the process, we can create a open space for mutual teaching looking forward to a meaningful learning process. Another method is to create a place where the creativity is one of the keys in order to imply the participants at a cognitive level. 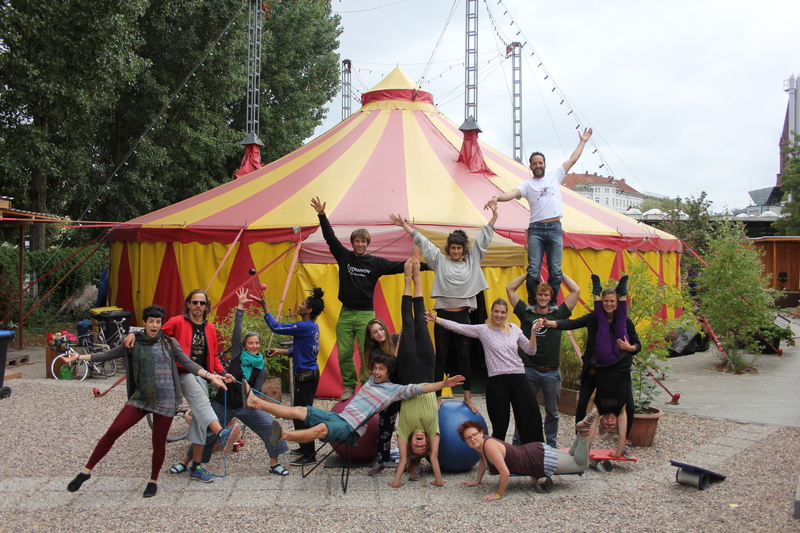 Through discussion groups we are looking forward to transfer all that learning process to a common methodology; activities and dinamiques to be applied on to social groups; being special relevance the incoming social intervention with a local youth social circus group. Group discussions are relevant because involves the group as a team where there might appear different ideas and theories which lead us to get deep and question our own thoughts. This discussions are group methodology which implies us to work as a team and find group solutions. At the social intervention the usual instructors will lead the sessions and include the participants of the workshop into the dinamiques and learning process by creating small groups of practice. Through this methodology we are looking to get close to a traditional methodology where the teacher has the authority and control; but the activities and the group environment keeps space for internal teaching and personal relationships which will assist to the participants to feel an important part on the learning process. Content of session: This first session will be focused on evaluating and pondering where is the object manipulation level and range of disciplines of the group; in order to create a starting point for the workshop. 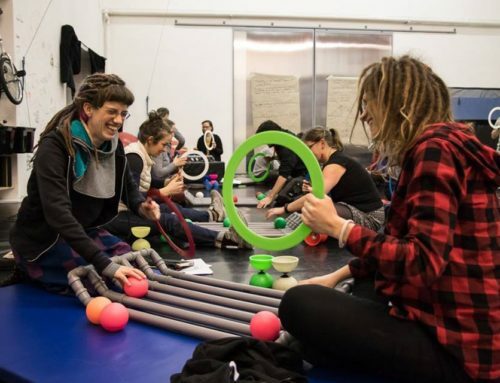 Also we will practice and learn about basic siteswap as it will help as to communicate and understand the merge of juggling with percussion; as well as there will be a some time for juggling with partners and play with some group juggling dinamiques. Objectives: To get into percussión initiation and learn percussión instruments from different parts of the world. Content of session: We will know traditional percussión instruments from the Carnaval of Salvador de Bahía (Brazil), and some others instruments from differents parts of the world; using these instruments we will learn differents rhythms and breaks, that we will use afterwards in a short composition. Regarding the level of the group we might start to apply some circus technics into drumming. 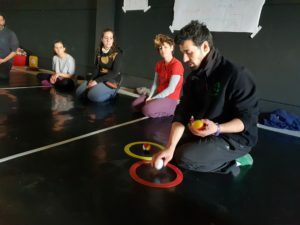 Objectives: To create basic patterns for juggling and body percussion on different levels. Content of session: On this full morning we will get deep into body percussion and juggling. 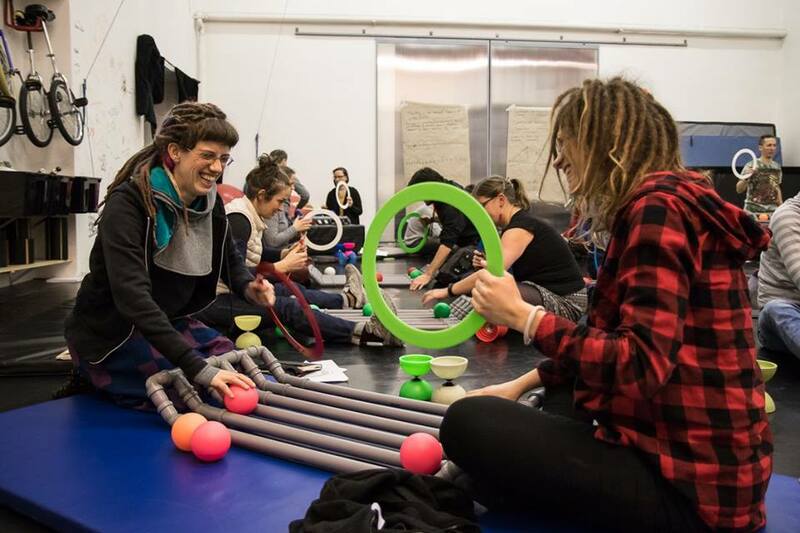 Through searching and experience the possibilities of juggling cascade with less than three objects to let us some space for creating music and rhythms along with a group. This session will be also be focused on the social session on the afternoon; to be prepared as a group and have a knowledge of what will be happening and how to approach the youth. At the end of the session there will happen a discussion about methodology. Objectives: To teach and experience this circus and percussion methodology to social youth. Create a rhythm with body percussion and juggling balls. Content of session: As most of the youth have been doing circus for some time we will have different juggling levels; our goal is to adapt this methodology to those levels and teach them as well as enjoying the session and play with the youth. Number of hours : 1 hours. 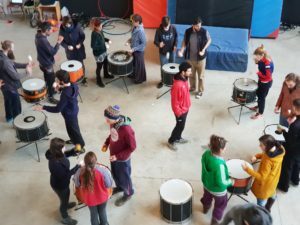 Wednesday morningObjectives: To improve as a group on percussion technique, using the circus skills we have learned previously. Content of session:In this session, we will put in practice all the circus skills we have practice in other sessions using them to create rhythms and easy composition, we also will use differents types of material to create the rhythms instead of traditional instruments, Barrels, woods, plastics, etc.. Objectives: To learn and improve juggling with partner. 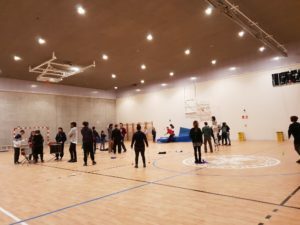 Content of session: This workshop will continue the line of session 1, so we will keep focus on juggling technique and throws; as well as it will be introduced pattern and possibilities of juggling with partner. Number of hours : 2 x 2 hours. Wednesday morning and afternoon. 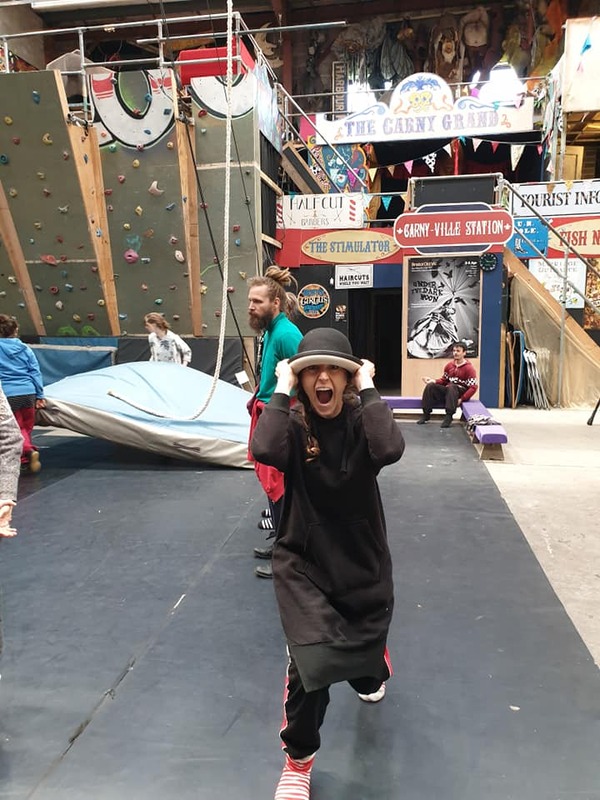 Content of session:As a way; both the circus and the percussion are arts with an unlimited number of possibilities; disciplines; objects and body movement; which all that together give us the tools to create and explore. In this session we are meant to play and experience some possibilities which can flow out from our ideas as well as to explore through some ideas already being used. There will be time to explore elements as diabolo, chinese plate, cigar boxes, pois, devil stick…. Objectives: To teach and experience this circus and percussion methodology to social youth. Develop circus and percussion mobility. Content of session:Bringing new activities and exercises to propose to the youth class, and looking to improve our knowledge and technique from tuesday class. Objectives: To obtain a full hand of activities, games and dinamiques. Content of session: This list of possibilities has the goal to help us to share the knowledge and to improve this merged technique. Through proposals from within the group we will experience how those games can reach out social participants. 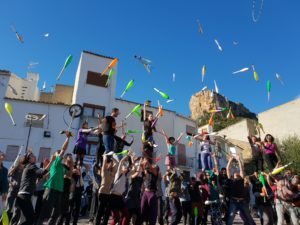 With this activities our aim is to introduce you to the local/national cultural and social community, specially circus, so you can create contacts, generate personal meetings with circus and percussion people, get more information about circus life beside Espai de Circ. 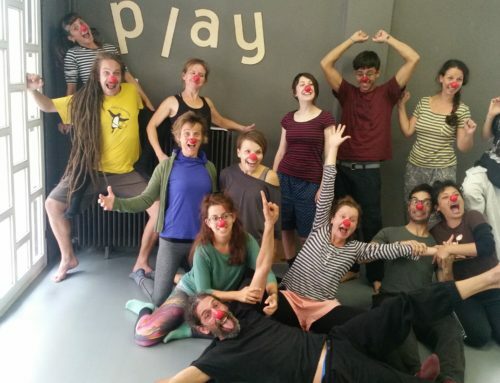 For us is a pleasure to include you in this activities cause it’s a good opportunity that our people can meet international circus&percussion people and socialize with them, get more information from you through an informal meetings about what happens in the other countries so we can exchange skills too. ASPRONA TIMBALS: You will have the opportunity to practice with this percussion group with Down syndrome. Getting there by bike. 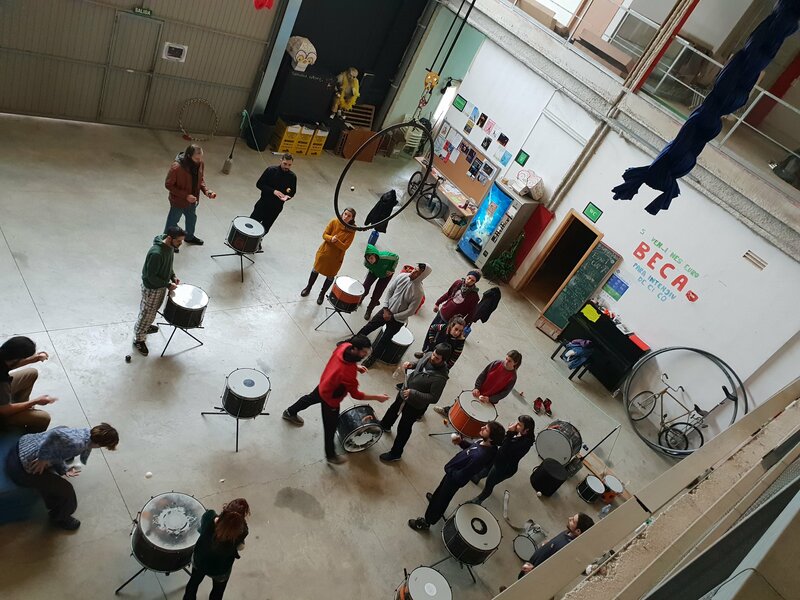 MEETING WITH PROFESSIONAL PERCUSSION GROUP: The rehearsal of the Borumbaia professional percussion group happens on Thursdays, after their training they meet and greet, you are invited to join them! Getting there by bike. FLAMENCO: Every Thursday, in La Chimenea, next to Pepita, you can enjoy Flamenco performances. Getting there by bike. 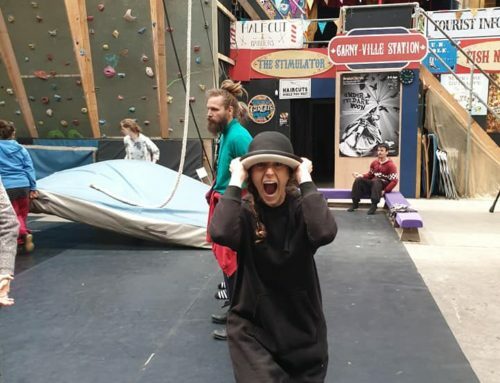 KAOTIK CIRCUS FESTIVAL 2019: The AVC’s Circus festival. 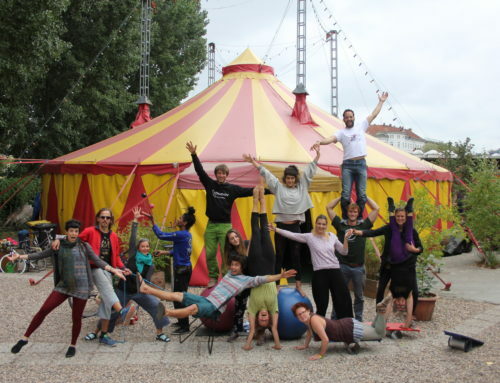 You will have the chance to get in touch with local and national circus people and also to enjoy and participate in a wonderful winter festival. The dates of the festival are 25th, 26th and 27th january. Getting there by car with AVC team. We will give you further information about the festival.